One of the most cared for and treasured emblems of any nation is their National Flag and sadly on occasions it can become a target for extremists. American University at the headquarters of Sivil Savunma (Civil Defence). 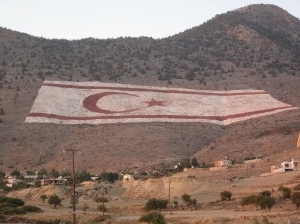 From here they were taken in a fleet of vehicles to the site of the gigantic Turkish Republic of North Cyprus flag which is made from rocks on the side of the mountain near to the village of Taşkent. The purpose of the trip for all of these volunteers was the cleaning of the national flag on its mountain site before the next painting of the flag takes place and this is what the CESV volunteers had to say about their day out. “It was a bit of a blowy day when members of the CES(v) met up with the lads from Girne Civil Defence and students from GAU at Sivil Savunma headquarters. We were all issued with matching T shirts and baseball caps before setting off up the mountain for the big flag clean! After bouncing around in CD Land Rover we arrived at the side of the flag to the sound of music and warm olive rolls for breakfast. started spreading out across the surface. Our merry little band joined forces with the Lefkosa CD (who we’ve worked closely with in the past) and more university students. 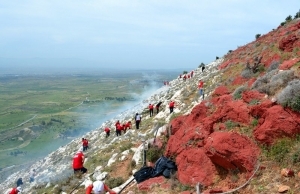 With great organisation each group was sent off to a different area of the mountain armed with picks and rubbish bags. Unfortunately for us we were at the top of the flag on the far side so it felt as if we had done a full day’s work before we even got to our destination! eady for a well earned lunch of doner and a drink. It was great to see everyone mingling and swapping stories of the day’s events while chilling out. There were a lot of tired faces and the games which had been going to take place after we had eaten were cancelled due to worker fatigue! extensively about this group now known as Civil Emergency Service Volunteers (CESV), I cannot help being impressed at the ongoing recognition of this expatriate group by the authorities. It is a needed source of support which gives first aid training to members of the Police, Fire and Ambulance Services, Schools and other Organisations. Perhaps more importantly on a personal level, through the activities of this group, it is great to see how many nationalities come together just to share in making their homeland what it is, a great place to live! The world’s largest flag, but because of politics, this is not recognized as a legitimate record by the Guiness Book of World Records. Such a shame, when will the world see sense and do the right thing for the Turkish Cypriots.